Tin Lizzy’s Cantina, Kennesaw GA – Marie, Let's Eat! We hadn’t been to a Tin Lizzy’s in such a long time. Marie and I had visited their location in Buckhead a couple of times before, when we were dating. As much as I remembered the oddball, tasty, decidedly non-traditional tacos, I also remember some sage advice from a beer company’s poster in the gents’. At the time, I was still smarting from a loan that was looking like it was never going to be repaid. (It wasn’t.) The poster read “If you lend a ‘friend’ a hundred dollars and never see them again, it was probably money well spent.” I felt so much better after I thought about that. Anyway, the fun little Buckhead store always struck me as an multi-sided peg in a square hole. I liked their menu, full of such eccentric ideas for tacos like gyro meat and buffalo chicken. Those have quietly become more common in the marketplace (as seen at Verde Taqueria, for instance), and I would argue that Tin Lizzy’s managed to inspire a sort-of clone, best left nameless here, who turned their menu into a sports bar concept and have been opening and closing and launching and shuttering big spaces all around the metro area. When Tin Lizzy’s decided to begin growing, itself becoming something more like a sports bar than they were a decade back, they did lose a little of the Buckhead store’s original, angular, charm, and their menu picked up a smoother, corporate sheen. Nevertheless, they’re an Atlanta original, the food is still quite good, and among the drink specials, you’ll find some Georgia beers like Terrapin and Monday Night. Marie and I were invited to visit their newest store, their seventh, which is just up the road from us in Kennesaw, and meet two of the managers, Aaron Hobbs and Ryan Snider. We arrived at dusk on a Monday and spent a couple of hours marveling at how absurdly busy they were. This store is ideally situated to draw in hordes of KSU students to their awesome patio, and draw them away from the nearby Taco Mac at that, and evidently the neighborhood had been begging for this place. It’s huge, seating about 170 people, with live music every night, and it was better than three-quarters full the whole time we were there. On a Monday, for a restaurant that had only been opened four weeks. 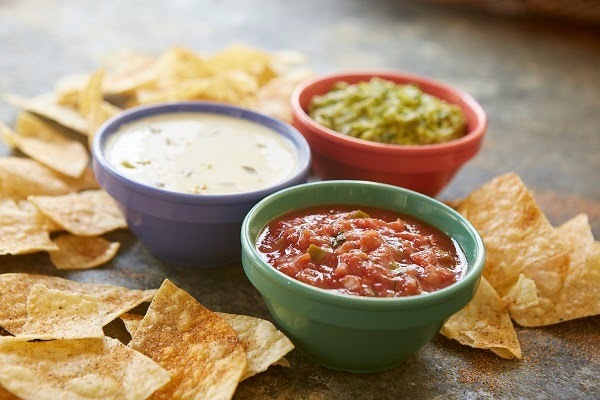 We ordered the Three Amigos starter, with chips, guacamole, cheese dip, and salsa. My only reservations about the meal at all came from the amount of salt dumped on the chips, which is beyond excessive and guaranteed that we wouldn’t finish a bucket of them. Do yourselves a favor and ask for your chips unsalted. You don’t need the salt, and the excellent guacamole certainly doesn’t. Marie elected against sampling the actual menu items and ordered a build-your-own skillet meal with chicken, peppers, and avocados. She was really pleased with all the flavors and just had a fine evening. It was such a gorgeous evening on the patio – hence none of our own pictures – and everybody was having such a good time that it was quite infectious. I started with two tacos and enjoyed them both very much. The Veggie was pretty much what I expected; the Low County Boil (!) was a hoot. It’s shrimp and chorizo in a medium-spicy sauce with corn, peppers, and tater tots. It’s ridiculous and silly and I liked it so much that I decided to try a third taco which was almost every bit as playful. It’s called the Southern Comfort and it’s got chicken, fried pickles, grilled onions, and goat cheese, smothered in a sweet brown barbecue sauce. I enjoyed it a little less than the others, because, as regular readers of our barbecue stories know, I prefer most any type of barbecue sauce to a sweet one, but it was still pretty good, and I really, really like how goofy these creations are. This is a restaurant that wants to have fun. For dessert, we shared part of a dish called The Grand Tinale. It’s a bucket of puffy tortilla chips dusted heavily with cinnamon and sugar and served with a smaller bucket of whipped cream. A group of three could probably finish it without too much guilt. At this stage, Tin Lizzy’s is very much a local chain, with all seven locations in the Atlanta area. However, they have a very, very ambitious expansion plan, and hope to grow sevenfold within six years. Two more Atlanta-area stores, in east Cobb and in Duluth, should be open by January. Later next year, they plan to open in other metros for the first time, with Augusta, Charlotte, Chattanooga, Birmingham, Knoxville, and Nashville all in the works into 2017 while they continue to blanket Atlanta. There’s reason to be cautious when a chain grows like this, because we’ve all seen quality suffer as big places try to maintain consistency across such a large area, but for now at least, the food is good, the selections are silly, and the experience, as demonstrated by that Monday mob, is a good one. Posted on October 15, 2014 August 17, 2017 by Grant G.Posted in atlanta, georgia, local chains, mexicanTagged atlanta, georgia, kennesaw, local chains, mexican, mexican - fusion. Pingback: Tin Lizzy’s Cantina, Dunwoody GA – Marie, Let's Eat!